In an ideal world, we’d all be using the Metric system, but the world is far from ideal, and math is confusing, so we’re sort of stuck. Most of the design work I do for objects (laser cut or 3D printed things) is done in millimeters. This makes sense, and is oh so easy compared to trying to use those damn inches! 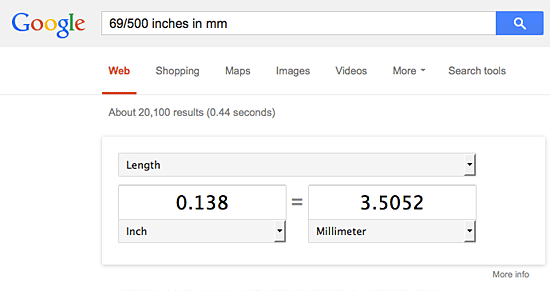 Sadly, I grew up with Imperial Units, and while I can roughly estimate what 12 inches is, I still have problems visualizing something like 100 millimeters. I can usually remember that it’s about 4 inches, but it’s still difficult to put my hands in space 100 millimeters apart without first converting it in my mind to 4 inches.. Dammit! 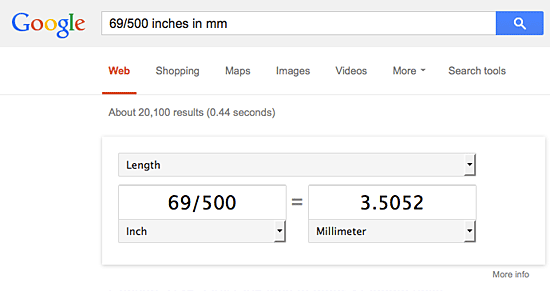 So if I wanted to find the Metric equivalent of 69/500″ (also known as 0.1380″) which is the diameter of a 6-32 bolt, I can find out. Oddly enough, when it comes to the small numbers, visualizing things is the opposite! It’s easy to visualize 3.5mm but impossible for me to imagine what 69/500″ looks like. Whatever! Here’s a simple chart of bolt sizes I’m posting just for my own use. While I would love to use Metric hardware more often, it’s expensive! I usually just buy random bits from the local hardware stores, and the Metric stuff is in short supply, and cost more. I find it quite annoying. I don’t know if prices online are any better, a quick search seemed to suggest not. Posted on Saturday, November 15th, 2014 at 1:23 pm. Subscribe to the comments feed. Both comments and pings are currently closed. Post on your own blog.